In what was supposed to be a draft year to remember for WHL star Nolan Patrick, adversity reigned supreme. Projected as the No. 1 overall pick coming into 2016-17, the Winnipeg, Manitoba native was limited to 33 games due to a nagging core muscle injury. The nature of the setback was at first misdiagnosed, as he turned out to have a sports hernia on both sides of his body. He required multiple surgeries and was out of game action for months. It wasn’t a particularly good look for a franchise that looked to put their hopes on him. 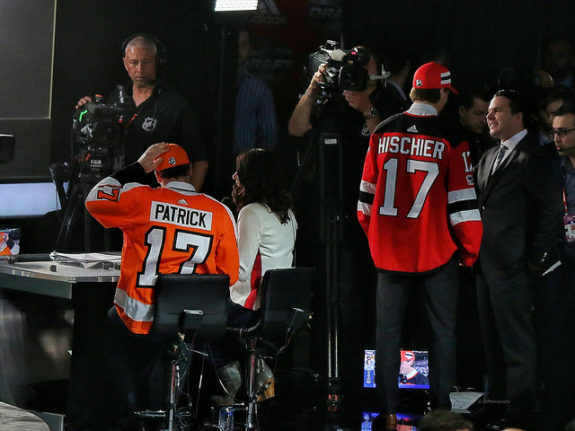 With the former Brandon Wheat King absent, an upstart Nico Hischier took his spot atop the draft board as the first overall pick come draft night. This alone should have given the Winnipeg Hawks product enough motivation to put the previous season behind him as he heard his name called second by the Philadelphia Flyers. The determination was evident in training camp, as the 19-year-old’s strong preseason showing earned him an opening night roster spot. It was time for his redemption tour to take shape. Sure enough, nine games into his career, Patrick suffered an upper-body injury when his face struck the glass after a hit by Anaheim Ducks forward Chris Wagner. This put him out for almost another month. When he returned on Nov. 16, the following 20 games weren’t too promising, either. The center posted just four points (one goal), along with 15 shots on net and a 42.67% Corsi-for percentage. Questions of whether he was NHL-ready or not were rampant. The transition from the Western league to the big leagues is difficult enough. A select few can do so effectively and make a career for themselves. To do the same thing after being in-and-out of game action in one’s draft year is an even higher ask. The calendar has flipped to 2018, and Patrick is starting to do just that. 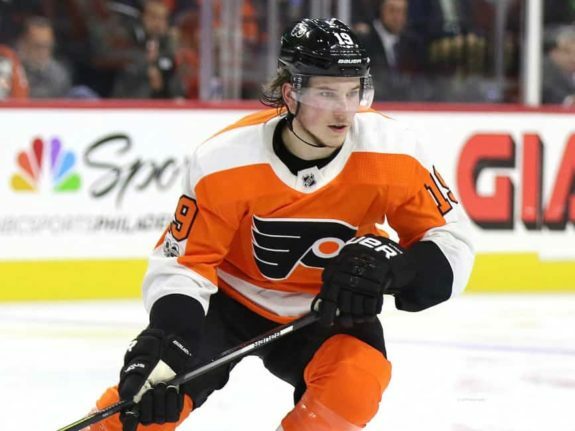 In 19 games since the start of the year, the former U17 Canadian team captain has posted a 54.40% Corsi-for percentage, good for first on the Flyers. At even strength, he’s topped the roster in on-ice shots for per 60 minutes, Corsi For per-60, and on-ice goals against per-60 in this span. It’s no coincidence that he’s subsequently landed 36 shots on goal in the process. Of course, one wouldn’t assume that the young forward has regained his mojo from his overall numbers since Jan. 1. He’s only scored three goals and six points in 19 games, giving him just 13 points on the year. However, those raw numbers will have to perk up soon if he keeps up his overall game, right? General manager Ron Hextall certainly thinks so. To me right now, he looks like he has a lot of confidence. It’s not just if you score a goal here or there, it’s more the plays he’s making – whether it’s defensive plays, offensive plays, passes he’s making, the way he’s seeing the ice, his positioning. Everything to me is just coming together for him right now and hopefully it continues. Head coach Dave Hakstol shared this view weeks ago. I think Patty’s played pretty strong, two-way hockey. He’s making good things happen with the puck. He’s much more comfortable having the puck. I think that’s one of the biggest developments in his game. The bench boss smartly rewarded the youngster for his start to the new year with a spot between Wayne Simmonds and Jakub Voracek on Jan. 31. The team’s second-leading scorer replaced frequent line mate Jordan Weal on the left wing that night. Since being paired together as a trio, they’ve generated a combined 54.45% possession rating with a plus-9.55% relative ratio. As the following chart indicates, Patrick’s impact has been evident with his most recent wingers. Since their combination, they’ve posted a combined seven goals and 19 points between them. Again, the overall offensive numbers look relatively modest. However, there is plenty of season left for their puck possession to translate. Besides, the team’s mid-season rebirth has more than sufficed. 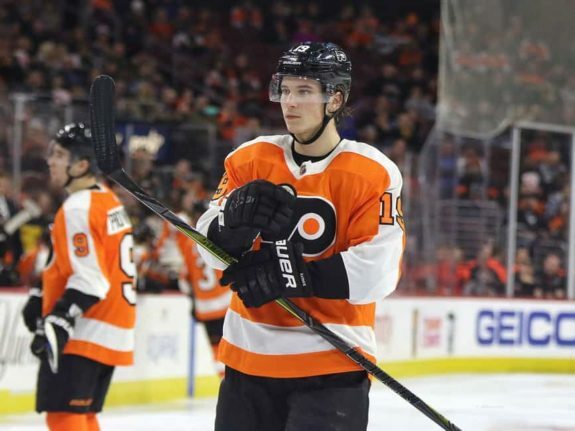 As Patrick matures, it could very well be said that in the near future, as he succeeds, the Flyers succeed. The team is starting to get a glimpse of this in the present as they simultaneously surge up the standings. Since the Winter Classic, the team has rattled off a 15-5-2 record, one that is fourth-best in the league in that span. In games where Patrick has tallied at least one point, the Flyers have notched at least one standings point themselves in 10 of those 12 games. If his offensive numbers start to perk up, the team could quickly become a playoff mainstay in a wide open Metropolitan Division where they are, as of this writing, ranked third. Philly will need as much help as they can get with goaltender Brian Elliott out for the next month or so. Innocently enough, the Flyers will face the same adversity that their lottery prize has for the last year and a half. Naturally, the youngster has the opportunity to play a large role in overcoming it. If his recent play has indicated anything, it looks like Patrick will be up for the challenge.